Mechanical movement, 18 jewels, silvered dial signed CARTIER PARIS BTÉ S.G.D.G, black Roman numerals, inner railway minute divisions, blued steel hands, rectangular case, bezel millegrain-set with rose-cut diamonds, beaded winding crown at 12 o'clock tipped with onyx cabochon, similar crown at 6 o'clock, double scroll diamond-set lugs, flexible rose-cut diamond-set link bracelet, "cliquet" clasp with security catch. With Cartier Certificate of Authenticity no. GE2012-196 and original presentation box. The present watch is an impressive example of Cartier highly jewelled timepiece set with 337 rose-cut diamonds and 2 onyx, preserved in excellent overall condition. 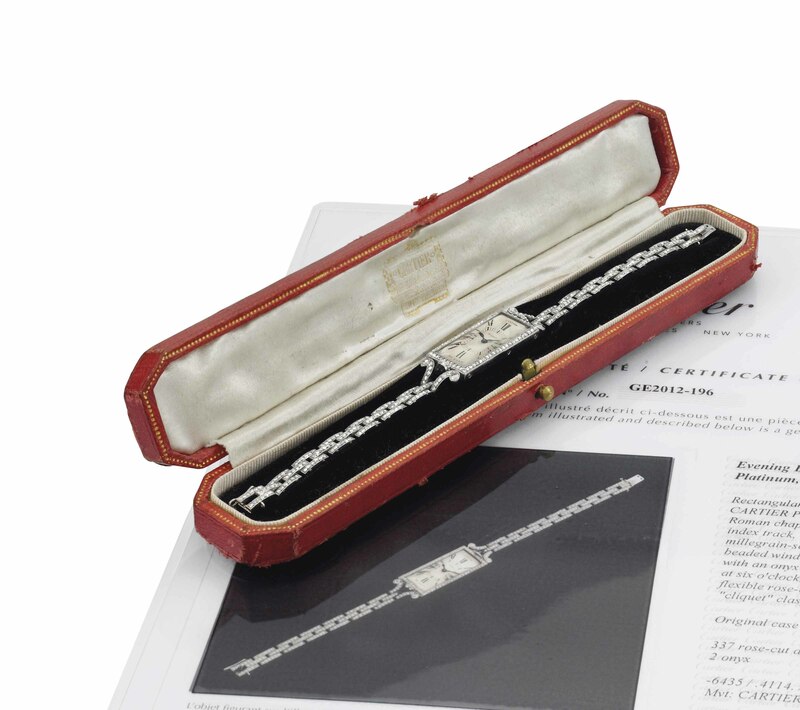 Other examples of Cartier rectangular and diamond bracelet watches are illustrated in Le Temps de Cartier by Jader Barracca, Giampiero Negretti and Franco Nencini, p. 112.